November has proven to be a month filled with surprises. Some good, some not so good. But I’ve grown up with the idea that there is always something to be thankful for. As we enter this year’s holiday season, I can easily say that I am thankful for my community, my friends and family, and my freedom to continue pursuing the little things I find happiness in… like baking this pile of pumpkin goodness! Ehem. Did you see that four-layer monstrosity (that will likely make an appearance for my upcoming Friendsgiving)?! 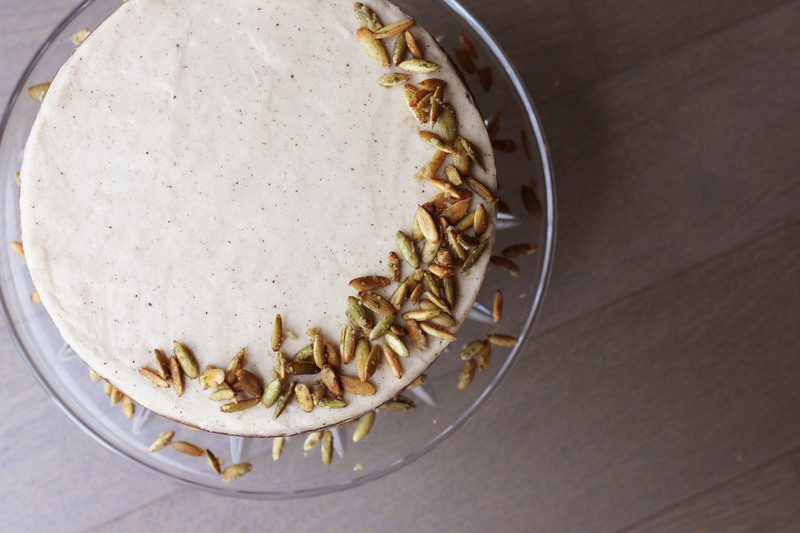 I was re-inspired by the pumpkin-hazelnut cake that I baked last year, but I wanted a little more pumpkin “oomph,” and letting that one ingredient really steal the show. 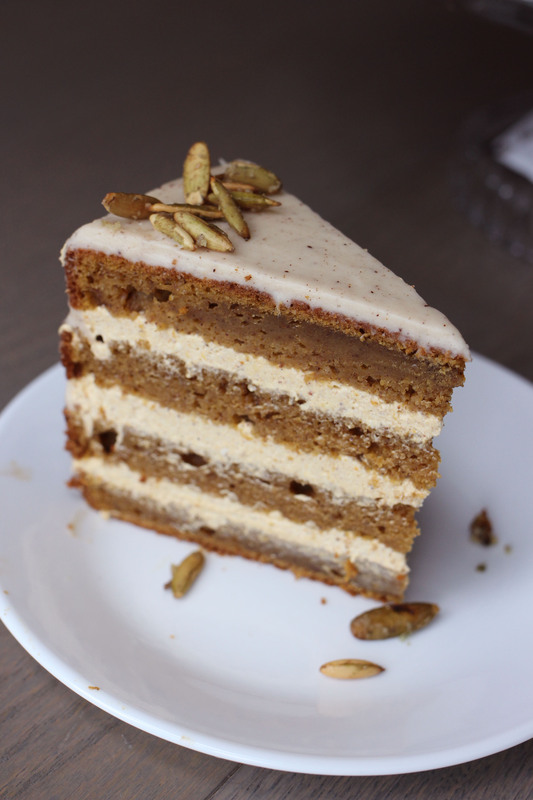 What transpired is a true pumpkin masterpiece, which is why I’m calling it “The Ultimate Pumpkin Layer Cake”! 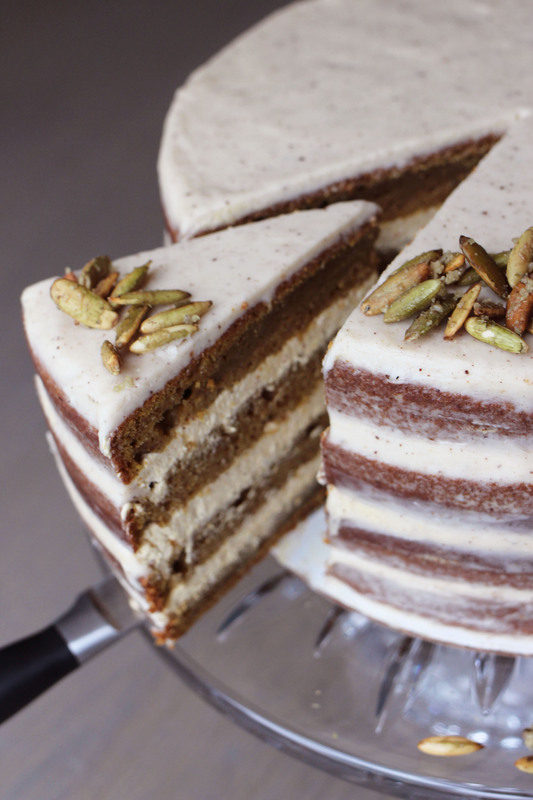 It’s a deliciously spiced pumpkin cake with alternating layers of pumpkin cheesecake filling. Yes, you read that right: pumpkin cheesecake filling. 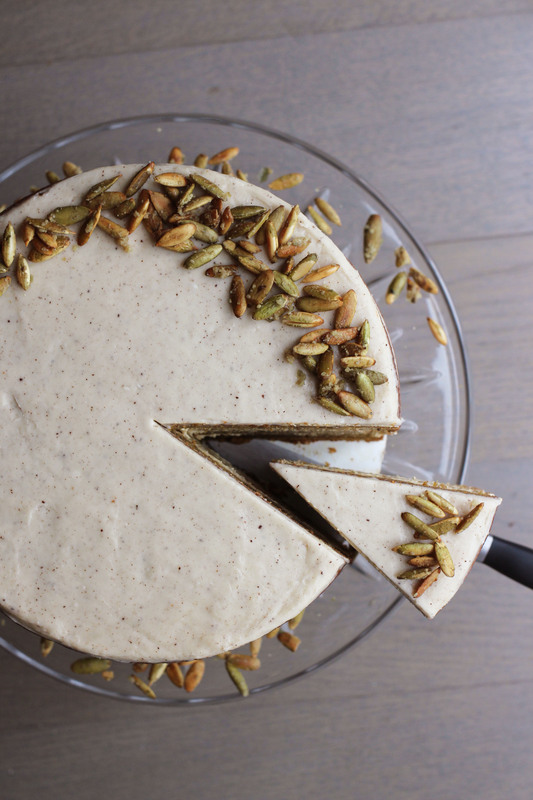 I wanted a creamy, pumpkin-y, rich and luscious center to go with each bite of this cake, and I think I struck gold with the no-bake cheesecake filling! An amazingly decadent four-layer pumpkin spice masterpiece filled with a luscious no-bake pumpkin cheesecake filling, topped with a to-die-for brown butter cream cheese frosting... It's the perfect Thanksgiving or fall-time dessert! Preheat oven to 350°F. Grease and line two 8-inch cake pans (I use a parchment round to line the bottom, and use cooking spray and flour to coat the sides of each pan). Sift all dry ingredients together (flour, baking soda, baking powder, spices, salt). In a mixing bowl, whisk eggs and brown sugar until incorporated. Slowly add in oil, applesauce, and vanilla, mixing with each addition. Fold in dry ingredients into wet in 3 additions. Mix until ingredients are just incorporated; do not over-mix. Divide batter evenly into the two prepared cake pans. Bake 45-55 minutes until done. To test for doneness, the center of the cake should spring back when lightly pressed and an inserted skewer or knife should come out clean. Let sit 10 minutes, then unmold onto cooling rack to cool completely to room temperature. Use a stand mixer with paddle attachment or hand mixer to beat cream cheese, pumpkin puree, greek yogurt, sugars, vanilla, and spices until completely incorporated. Add cool whip and continue to mix or fold until completely incorporated. Use a stand mixer with paddle attachment (or hand mixer) to beat cream cheese and browned butter until incorporated. Add sugar, salt, and vanilla and continue beating until creamy. With a long bread knife, trim the cake tops and cut in half to create 4 even cake layers. Ensure that cakes are completely cool prior to cutting or assembly. Place one layer of cake on a round cake board (tip: use a small amount of frosting or filling between the board and the cake to act as "glue" and keep the cake in place). Pipe an even layer of pumpkin cheesecake filling on top of the cake layer. Use a small offset spatula to even out the filling. Place the next layer of cake on top of the filling. Repeat Step 3 twice more (for a 4-layer cake). Once all 4 layers are stacked, frost the top of the cake with the brown butter cream cheese frosting. Use remaining frosting to lightly frost the sides of the cake for a "naked cake" finish. 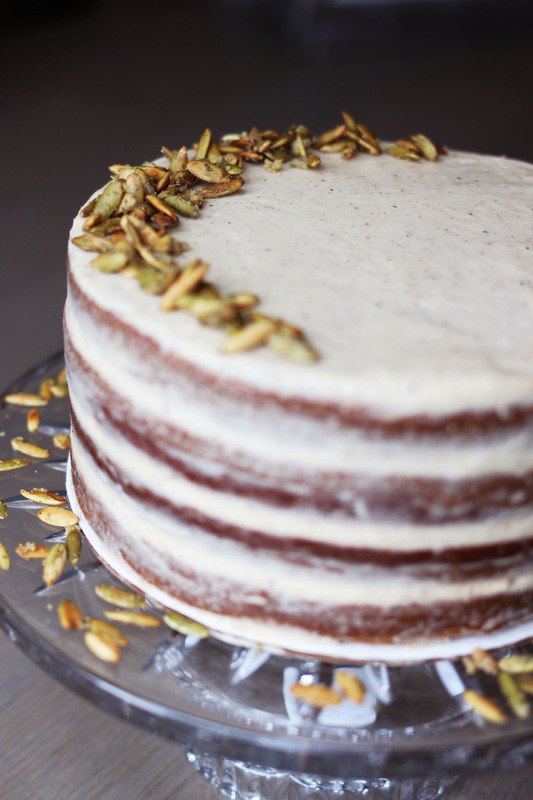 (Optional) Finish by sprinkling toasted pumpkin seeds along the edges of the top of the cake in a decorative fashion. Serve at room temperature. 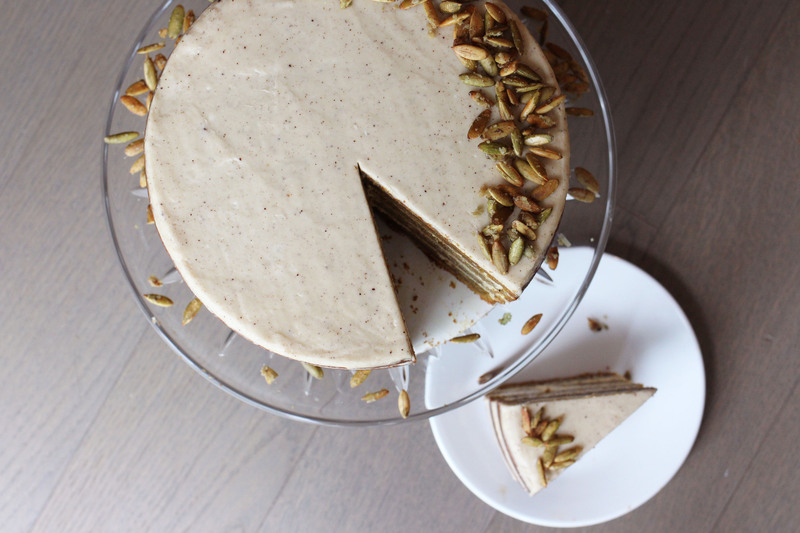 This cake feeds 10-16, depending on how large you like your slices :) Enjoy! - Heat butter in skillet until melted and starting to bubble. - Stir continuously (I use a silicone whisk or spatula) until butter mixture appears to brown. There will also be a toffee-like, carmel-like aroma. - Take off heat and cool to room temperature prior to use. Can be refrigerated for faster cool down.